The new Samsung Galaxy Note smartphone, the Galaxy Note 7, has been equipped with everything that the best phablet of this year should have. On the other hand, the new iPhone model, the iPhone 7 Plus, features everything that makes it the best Apple phablet of all time. Both of them are amazing. But which one will clinch the win if they take out each other in the battle? Read this article to find the answer. The Galaxy Note 7 looks quite similar to the Galaxy S7 Edge. The curved, all-glass back and shiny finish have made it an incredibly attractive device. On the other hand, the iPhone 7 Plus comes with the similar look as its predecessor. It looks good. But it doesn’t look as attractive as the new Samsung Galaxy Note smartphone. But on the bright side, it is more scratch resistant than the Galaxy Note 7. However, in terms of taking a dip, it is not better, as it features IP67 rating, but not the upgraded IP68 certification as its competitor. The 5.7-inch QHD Super AMOLED display comes with an extremely high pixel density of 518 ppi. It is able to produce a stunning view. Moreover, with the introduction of the Mobile HDR, it is able to produce a more vibrant view while playing HD videos. On the other hand, the 5.5-inch display of the iPhone 7 Plus comes with a lower pixel density of 401 ppi. Moreover, it features the same IPS LCD panel, which always fails to outperform the Super AMOLED panel. As a result, it fails to produce as stunning view as the display of the new Samsung Galaxy Note smartphone. The Galaxy Note 7 comes with the same 12-MP primary camera as the Galaxy S7. It features the same dual pixel technology. Its performance in the low light condition is outstanding. The iPhone 7 Plus comes with 12-MP telephoto camera and wide angle camera simultaneously. Thanks to the dual-lens setup, which enables it to perform optical zoom brilliantly. More specifically, in this area, it is better than the shooter of the new Samsung Galaxy Note smartphone. The widened f/1.8-inch aperture has improved the performance in the low light environment significantly. However, in this situation, the shooter of the Galaxy Note 7 is still the champ. Thanks to the larger aperture of f/1.7. The Galaxy Note 7 features the Exynos 8890 chipset and 4 GB RAM, which allow it to operate at an outstanding pace. On the other hand, despite featuring less RAM of 2 GB, the iPhone 7 Plus is able to work at a faster pace. Thanks to the new A10 chip, which is 30% faster than its predecessor. Yes, the 3500 mAh battery of the Galaxy Note 7 has created controversies for being burnt abruptly. But once this issue is fixed, it will become one of the best phablet batteries of all time. Its outstanding endurance rating of 90 hours says it all. The performance of the 2900 mAh battery is good. But it is not as great as its competitor. Moreover, it doesn’t support the fast charging technology as the battery of the Galaxy Note 7. In terms of more scratch resistant body, camera’s zooming capability and faster performance, the iPhone 7 Plus is the winner. However, in terms of the eye catching look, better waterproofing capability, better camera performance in the low light condition and stronger battery, the Galaxy Note 7 is the winner of the battle. This is the end of the article. 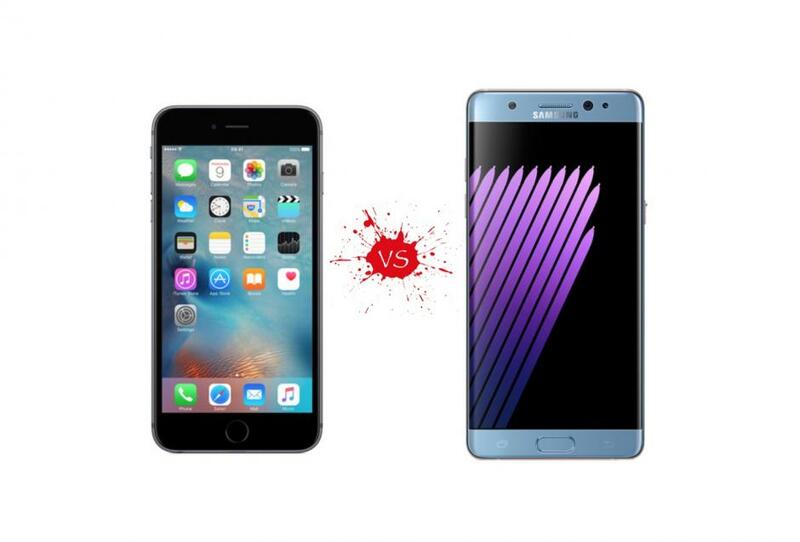 What do you think about the battle between the new Samsung Galaxy Note smartphones and the new iPhone? Share your thoughts by hitting the comment button.